Gran Tierra Energy’s operating philosophy, Beyond Compliance, influences the decisions we make regarding how we meet our commitment to Corporate Social Responsibility. Beyond Compliance means that whenever possible Gran Tierra voluntarily goes beyond what is legally required to ensure people’s safety, care for the environment and respectful engagement with local communities. 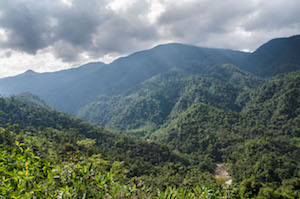 Gran Tierra Energy has a five-year partnership with global NGO, Conservation International to undertake a large-scale reforestation and conservation project in the Putumayo region. 105,000 hectares of forest will be protected or reforested as a part of this project. 40 family nurseries and 100 satellite nurseries near the reforestation areas will be created as a part of this project. By the end of 2017, the Forestry Centre had nearly 240 hectares of land that are conservation forests or are in the process of reforestation. 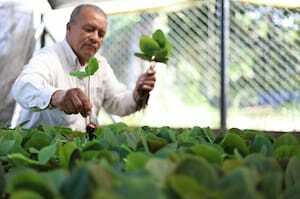 Produced 34,540 native tree seedlings in its nursery, which will be planted on land GTE has purchased for reforestation. In May 2017, the birth of a “Tigrillo” (Leopardus tigrinus) kitten on the Centre’s land indicates that its location and size has created an area where new species can be accepted. In November 2017, Gran Tierra signed a collaboration agreement with the National Cacao Growers Federation, or FEDECACAO, to establish four cacao (the seeds from which chocolate is made) nurseries in areas affected by the armed conflict. The priority is to start economically productive projects that will improve the quality of life for citizens who live in post-conflict zones. As part of the agreement, GTE will contribute 1.313 billion Colombian pesos to upgrade and strengthen cacao development in these regions. 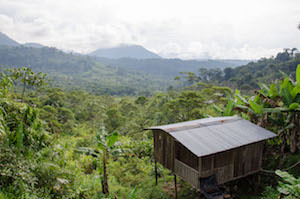 The objective is two-fold: to help the reintegration process by getting former guerillas to become involved in making and maintaining the nurseries and to help farmers who grew illicit crops learn how to cultivate cacao, a financially viable substitute. 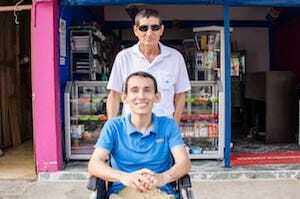 Two nurseries will be located in the town of Puerto Asís, Department of Putumayo, and two in the town of Uribe, Department of Meta, areas that do not have the resources needed to sustain legal production systems. The government is working on infrastructure like roads, power, and communications to address the situation holistically. 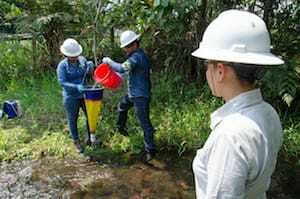 An example of the impact Gran Tierra’s Beyond Compliance philosophy can have on important decisions took place on October 4, 2017, when the company signed an agreement with the Government of Colombia to voluntarily restore an environmentally sensitive area that was contaminated years ago when an oil well was targeted during the armed conflict. 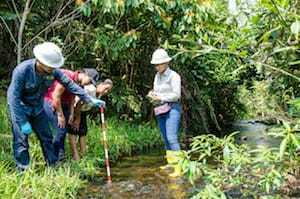 Although this well, the Azul Grande, in southwest Putumayo did not belong to Gran Tierra, and the company has no legal obligation to engage in the cleanup, GTE chose to participate as part of its commitment to environmental protection. Also participating in this project is CORPOAMAZONIA, an Autonomous Regional Corporation (Corporación Autonomia Regional–CAR), which has jurisdiction over departments in the southern Amazon region of Colombia and is responsible for overseeing environmental management within their jurisdiction. Gran Tierra Energy has worked to improve the cultural development of communities within the Puerto Limón region. Gran Tierra donated COP $257,683,985 to the Fundación Nacional Batuta— a music centre that offers programs to enhance social development and musical training for children and adolescents. The Centre provides a space where young people can actively participate in a variety of musical activities such as reading and writing music, building traditional Pacific music instruments, singing and playing musical instruments. The Centre has had a positive impact on the local community of Puerto Limón, welcoming 140 children and adolescents to the music centre, along with providing many jobs for musical instrument craftsmen and music teachers. Educators from schools in the area are attributing the improvement of student memorization, increased attention spans, and improved learning in other school subjects to the activities and programs that students participate in at the Fundación Nacional Batuta. As Gran Tierra increases its field operations, economic benefits flowing to local businesses and communities are also growing. GTE’s Fair Bidding Process and other procurement procedures are designed to maximize opportunities for local and regional communities. Comply with all national laws. GTE will inform each vendor about the results of the bidding process, and bidders can request additional information to help them understand what they need to do to improve their chances in the future. Gran Tierra conducts social programs that promote economic empowerment for communities in both the Putumayo and Middle Magdalena Valley regions. The programs begin with providing participants with comprehensive Diploma Courses in leadership and business skills. A second phase follows, when participants can develop proposals for new business ideas. Once their proposals have been assessed and accepted, the aspiring entrepreneurs receive technical and business management training as they develop their craftsmanship and businesses. Gran Tierra then provides ongoing support and progress evaluations to make sure participants deliver robust business plans and are positioned to be successful. 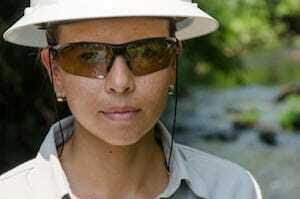 Gran Tierra performs rigorous environmental impact assessments of its proposed projects. An important part of GTE’s approach is being transparent about environmental practices, inviting communities to witness its activities and dispelling myths. The goal is to show communities what the company is doing, rather than just talking about it. If you are interested in visiting us please contact us at: [email protected]. Gran Tierra believes that the protection of freshwater is an essential part of responsible oil and gas exploration and production. The company is committed to ensure that its operations do not have an impact on groundwater and aquifers. Independent monitoring and testing has confirmed that Gran Tierra has fully safeguarded groundwater quality throughout its history of drilling operations in Colombia. Gran Tierra regularly monitors and analyzes surface and groundwater using an external lab certified by government authorities. GTE stands by these results and will fund additional independent studies of the water if the communities wanted to hire their own laboratory (as long as it is certified by Colombian regulators). GTE then takes its own samples and compares them with the communities’ sample and shows the results at a community meeting. Provided materials to repair the Villagarzón aqueduct, this repair benefited 10,914 people. Provided equipment and gravel to fix an emergency exit road, this repair benefited 1,800 people. Provided emergency kits to 30 communities in Mocoa. Supplied 169 elementary students with school kits so they could continue to attend school. Plotted all related maps for the Mocoa Risk Committee & CORPORAMAZONIA so they could better understand the effects of flooding. In the longer term, Gran Tierra continues to provide support through a commitment of USD$17,586 to help families as they rebuild. 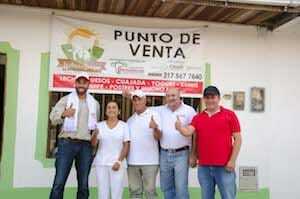 Gran Tierra is undertaking this project alongside Vetra who has pledged USD$10,345 and the Mayor of Mocoa. Through this project 48 Mocoa residents will see their homes restored. Gran Tierra Energy is committed to helping our neighboring communities by providing the necessary support needed in times of crisis. Heavy rain during the early morning of April 1, 2017 caused catastrophic flooding and mudslides in Mocoa, the regional capital of the Putumayo Department, resulting in the tragic loss of over 300 lives and major damage to the city’s infrastructure. Immediately starting on April 1, 2017, Gran Tierra provided assistance to the disaster recovery and relief efforts. Our initial focus was to assist the Government and rescue teams. 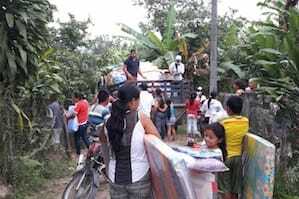 We delivered over 20 tons of food and water and more than 5 tons of goods and basic necessities to the impacted areas. Gran Tierra also provided equipment, civil works and infrastructure to help with the re-opening of roads and assisted in the reconstruction of bridges to allow the entry of humanitarian aid to Mocoa. Gran Tierra also provided electricity to the regional hospital and the Mocoa mayor's office building, as well as transported a water treatment plant from Bogotá to Mocoa. We cooperated and coordinated with the national and regional Governments to implement infrastructure projects to support Mocoa’s recovery. Contributed more of 5 tons of goods and basic necessities. Provided 90 feeding kits and 3,000 liters of bottled water. Provided remittances for 25 families (10 people per family) for 5 days. Provided 4 deliveries of household supplies including: sheets, blankets, emergency tents and mattresses. Employees collected and donated 25 boxes of clothes and non-perishable food. Supplied 120,000 gallons of water daily for the hospital and neighborhoods. Supplied more than 4,000 gallons of fuel for airport support, power plants and to operate the machinery for road improvement. Contributed electricity to the Hospital and to the Mocoa Mayor's Office building. Assisted in the reconstruction of bridges with rig mats (platforms and structures) to allow the entry of humanitarian aid to Mocoa. Provided equipment, civil works and infrastructure to help with the re-opening of roads. Mobilized electrical experts to carry out a study of the state of the Electrical System of the Junín Station and managed measures to fix it. Provided transportation for the delivery of food, for rescue teams and for members of the government commission. Provided additional transportation support including helicopters, light and heavy trucks and airplane tickets. Transported a water treatment plant from Bogotá to Mocoa. The President and CEO of Gran Tierra Energy, Gary Guidry, also announced a matching program hours after the tragedy, whereby any donation made by employees would be matched dollar for dollar by the Company. The total donation raised was over $126,000,000 COP from employees in Colombia, Canada, members of the Board of Directors and the matching contribution from Gran Tierra Energy. 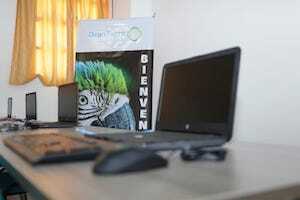 With the funds GTE raised after the Mocoa disaster a donation of a computer classroom was made to the Colegio Ciudad Nueva Mocoa educational institution. Located in the direct impact zone of the disaster, Colegio Ciudad Nueva Mocoa was one of the most affected schools. The institution lost 32 children and 7 are still reported missing. In addition to this tragic situation, 80% of the school population lives in the worst hit neighborhoods. This initiative was requested by the Mocoa community in order to strengthen education and digital literacy in the region. Once the computer room was built, it was equipped with 20 computers, Microsoft Office licenses, a video projector and screen, tables, chairs, and air conditioning for the room. Additionally, the donation included a series of entrepreneurship workshops to provide graduating students with tools to formulate business ideas. Gran Tierra Energy also made a donation to the Caliyaco Educational Center. This school is located in the village of Caliyaco in Mocoa, Putumayo, and was also devastated by the impact of the disaster. After analyzing and discussing the various needs and priorities that the educational institution required after the disaster, it was decided to support the school by providing building and construction material, new kitchen appliances and furniture, office equipment, as well as computers and a printer. Through this donation, the Caliyaco Rural Education Centre was able to reintegrate students back to school in a positive way.